Lynne came to St. Peter’s from St. Luke’s Church, New Haven, CT, where she served as priest-in-charge. 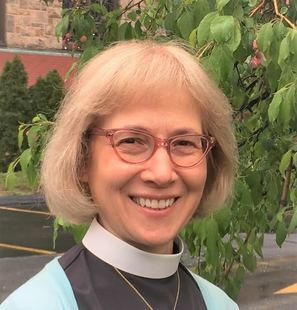 Since 2008, she has specialized in transitions ministry, having been called to be interim rector for parishes in the dioceses of Newark, Long Island, and New Jersey (and several years ago, Pennsylvania). The challenge of entering new congregations, learning the “lay of the land,” getting to know the community, and partnering with leaders to keep ministries lively and look ahead strategically is work she enjoys. From ’99-’08, Lynne was the associate coordinator of the Office for Ministry Development on the Presiding Bishop's staff at the Episcopal Church Center in NYC. Her duties included: assisting diocesan and provincial networks, staff from other denominations and the deans for our seminaries in promoting leadership development, ministry in daily life, and theological education for clergy and laity church-wide. In 2008 she filled in as short-term, interim program director for the Episcopal Church Foundation in NYC, where she coordinated the Foundation’s fellowship grant program and developed workshops for vestries. Prior to joining the Church Center staff, she was the rector of Christ Church (now Holy Spirit), West Haven, CT; and associate rector, St. Asaph’s, Bala Cynwyd, PA.
Before ordination, Lynne—a native of Cobble Hill, Brooklyn—worked as a senior urban planner engaged in environmental impact studies, affordable housing development, and for the City of NY she worked as a waterfront development coordinator. She holds an M.S. in City Planning from Pratt Institute, and her M.Div. is from The General Theological Seminary. She obtained a certificate in Faith Based Community Development from the University of Delaware, as continuing education. Building on earlier professional training from the Interim Ministry Network and the Alban Institute, she also has been trained in Appreciative Inquiry through the Clergy Leadership Network. In the Diocese of NJ she attended continuing education programs in Christian formation in the internet age, and how congregations are engaging in radical welcome.